Back when Dior first released their Dior DiorSkin Air Flash Spray Foundation I was one of the first people in line to buy it. Thing was, it was a total rip-off. It had the same $60 price tag, but it was a scant 1 ounce or so, whereas its current incarnation is 2.3 ounces. I guess they heard people’s complaints that the stuff only lasted for a month or so! Years later SK-II’s Air Touch foundation system was released. It was the first truly portable and accessible to the masses airbrush system, and I was hooked~and still am. The thing is, refills can get rather pricey and the inordinate amount of time that it takes to dry can get a little annoying. Enter Carmindy’s take on the airbrush foundation craze. I’m sure all you What Not To Wear watchers have seen makeup-artist extraordinaire Carmindy reach for her trusty Classified Era airbrush foundation to fix many a blotchy copmlexion, and I guess she figured it was finally time to come out with her own. Not a pretty sight huh? 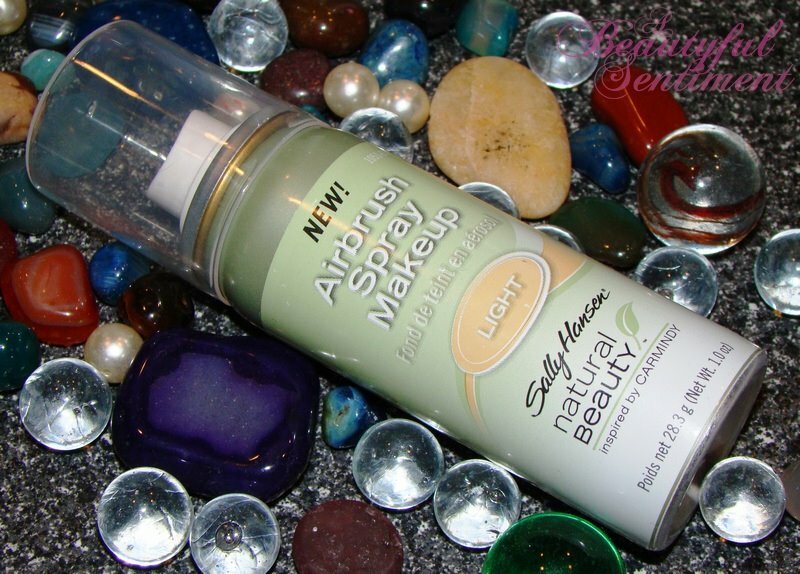 Regardless, I insist on spraying this directly onto my face because to me that’s what an airbrush foundation is. I’ve used it both ways, and here are my thoughts. The first two ingredients in this product are butane and isobutane–not so into that. Butane can be horribly drying for our delicate complexions, and I really can feel that this dries my skin out, especially when you spray it directly onto your face (but even when applied to the hand then face). There’s a refreshing cooling sensation upon spraying, but it turns to an uncomfortably cold sensation that you just know is a result of all those chemicals in the product. 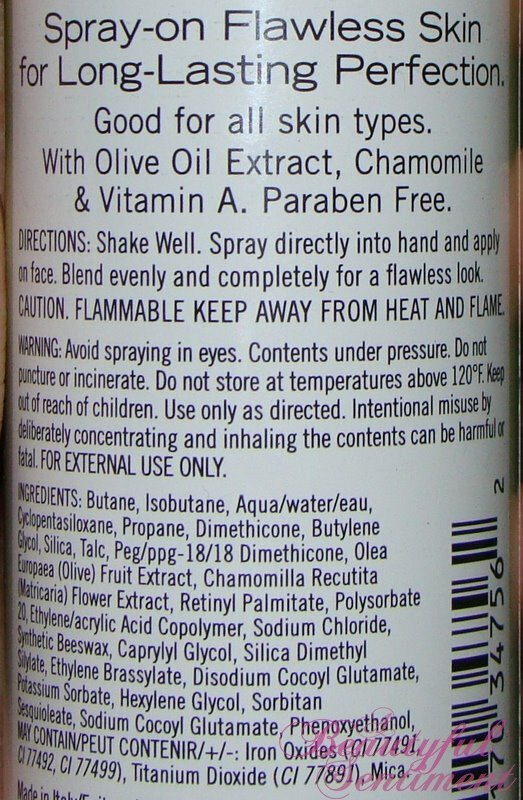 Quick spray of product prior to blending. BUT the coverage of this product is rather beautiful in that you can get sheer to full full coverage pretty quickly. It dries very rapidly (probably thanks to all the funk stuff in there) to a matte, somewhat drying finish and is great for keeping the oilies at bay, plus it stays put really well. Color-wise I picked up LIGHT, and I happen to think that it’s a little too dark and too yellow for my NW 15-20 complexion. I can definitely pull it off, I’m just not 100% happy with it. Post blending and completely dry after all of 5 seconds. All in all I have mixed feelings about this one. You do get a gorgeous, smooth, somewhat airbrushed looking finish that dries rapidly, but the color range is very limited, it’s a little pricey for a drugstore item at $14+ after tax, and most significantly I’m a little leery of the butane and other chemically-sounding products on the ingredients list. So while I was waiting for my Konad order to arrive a week or so ago I felt this major compulsion to do at least a little something fun with my nails, so on a mid=afternoon run to Duane Reade (hey other people take cigarette breaks, I take Duane Reader breaks!) I picked up a Sally Hansen Nail Art Pen in Hot Pink to mess around with. 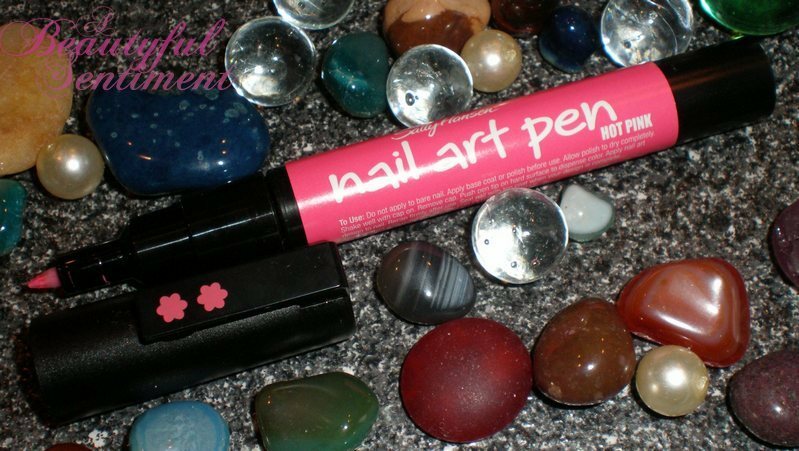 This product is essentially a fine-tipped pen that you can use to draw designs onto your nails–great in theory and pretty decent in practice! So what did I love? Well the color for one–the hot pink popped beautifully against my Chanel Black Satin. I also really appreciated that the fine tip was actually fine, meaning that I could get a decent amount of detail onto my nails with relative ease. Not so much? Unless you’re ambidextrous, one hand is going to look fabulous while the other hand will look like a toddler scribbled all over it. Also, since this is a glorified pen you’re options as to what you can create on your nails is somewhat limited. Verdict? I actually had a ton of fun with this pen and fully instead to get quite a bit of use out of it, but now that I have my Konad I’ll be relying on that for anything more complex than basic stripes or polka dots. I’m thinking that my Konad and the Sally Hansen pen may get along quite well, however, since I can use the pen to color in some details on my Konadicures. I foresee a long and happy marriage between these two products!